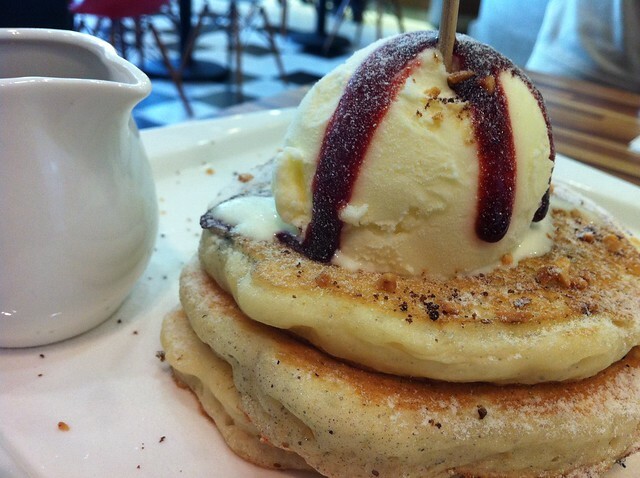 I found this awesome restaurant at City Square Mall in October 2012 - Paddington House of Pancakes. We opted for the simple blueberry pancakes topped with a scoop of ice cream. While waiting for the pancakes to be served, I was kind of complaining to The Husband about the price they are charging ($9 - $10) us for something so simple. When the pancakes were served, it was nicely presented with a scoop of vanilla ice cream on top of three thick pancakes, one stacked on top of the other. I was skeptical at first until I took my first bite and was rocketed off to to gourmet heaven straight away! How could something so simple taste so delicious!?!?!? It was soft, light and warm with a pleasant vanilla aftertaste lingering in the mouth. It's official - they should change the restaurant name to "God of Pancakes"!